*❤❤Luxery Stainless Steel band for Fitbit Versa. Fashion and classic. *❤❤Unique elegant luxury design,Stylish delicate and honorable looking. *❤❤This stylish band is perfect for girls and women and is a good choice as an exquisite and shiny gift for any occasion: Christmas, Thanksgiving Day, Mother's Day, Wedding Anniversary, Birthday, Valentine's day etc. *❤❤Chic Design for Fitbit Versa. High quality stainless steel. Not Metal. *❤❤Unique elegant luxury design, unique stylish, smooth, comfortable, beautiful colors, feminine and elegant looking, increase your beauty, enjoy your life. 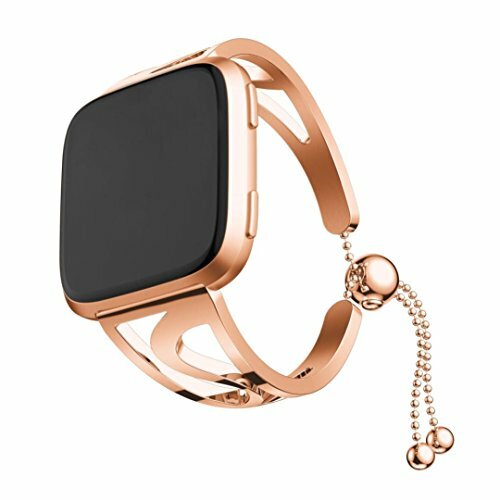 Chic Design for Fitbit Versa. High quality stainless steel. Not Metal. Luxery Stainless Steel band for Fitbit Versa. Fashion and classic.